This is a simple free basic syntax highlighted tabbed HTML editor. User selectable "new" files, i.e. 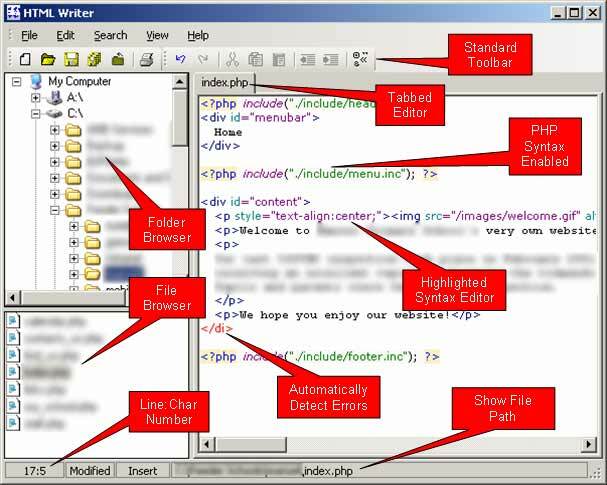 HTML, PHP, ASP, etc. Added more file functionality, i.e. copy & paste folders, etc. Browse folders and files on left of screen (like Windows Explorer). Open and edit multiple files. Keyboard commands to set bold, italic, underline text. Indent/Unindent using either keyboard (Shift+Ctrl+I/U), toolbar, or menu item. Open/save &apos;the desktop&apos;. Save all open files and re-open them together, including cursor position.